In May, some necessary house repairs are going to happen, so in preparation I’ve been hunkering down on the book and other writing-related tasks, to get as much done as I can before devoting my time to physical labor. I managed to squeeze in some traveling to visit friends who I’ve been neglecting. Including writer Laurie J. Marks and her wife Deb Mensinger (who you may remember from discussions of her liver transplant a few years ago). Laurie, by the way, has handed in to her publisher, Small Beer Press, the last volume of her Elemental Logics series, Air Logic. Despite having a very demanding day job at UMass, Laurie’s hard at work on her next novel, and we found some time to discuss both her new work and Book 5 of the Steerswoman series. We were both pleased with what the other had come up with, which is a splended thing about talking to fellow writers. By the sidewalk outside L&D’s little bungalow. By the way, Book 5 is now offically called The Changes of the Dark, a name I’ve gone back and forth on a few times. But when I released the paperback of The Language of Power, I wanted to include a sample chapter of the next book at the end, as I did with the other volumes, and I finally needed some damn thing to call it! I decided that there was nothing wrong with The Changes of the Dark as a name after all, so I’m goin’ with it. The title comes from Einar’s “The Ghost Lover,” a song that keeps showing up in fragments in the series — and will continue to do so until eventually we see all of it. 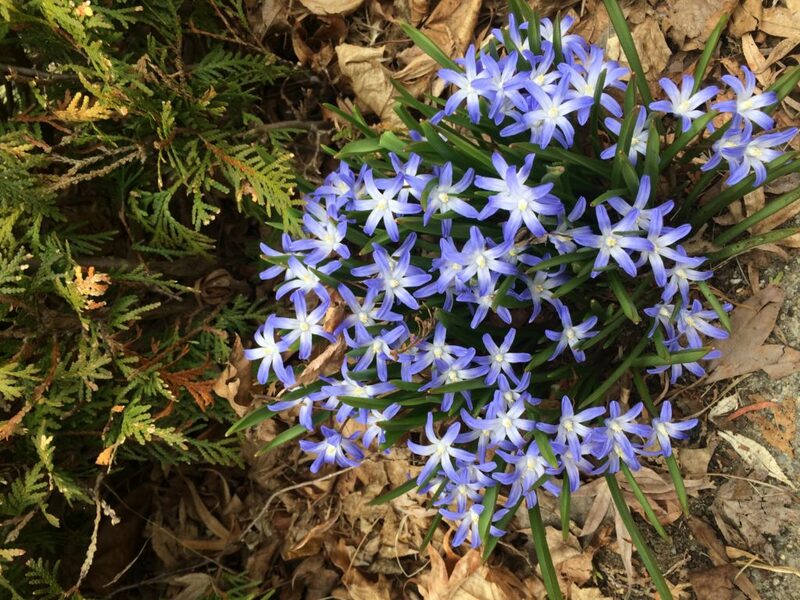 My sister and I also visited our pals in New Hampshire, of whom I’ve spoken before — they of the lovely house on the pond with many blue herons and a very decorative cat. 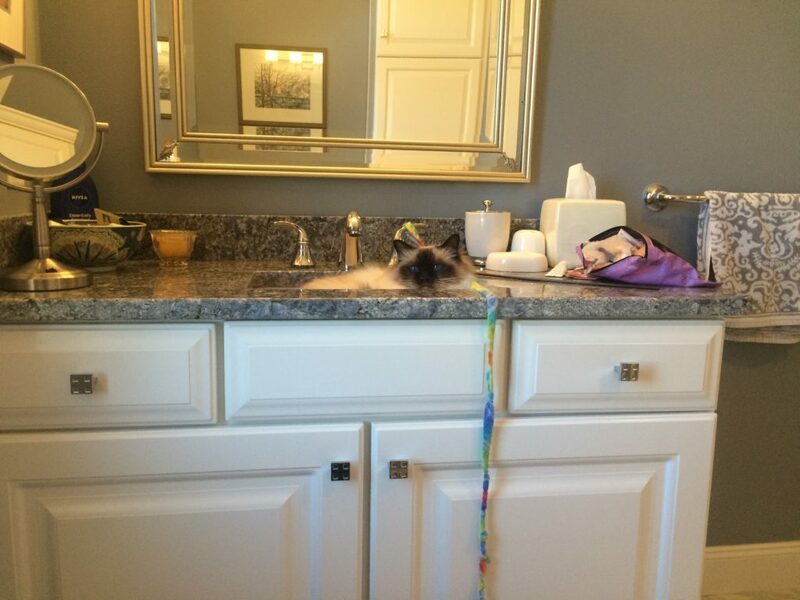 What do you mean, you want to wash your face? Meanwhile annoying minor medical crap continues. (Minor as in not life-threatening.) That business I mentioned about my hands last time? Still going on. Saw a doctor, got some meds, zero discernible effect. They’ll be getting a querilous call from me on Monday, you bet. I want to play guitar! But I cannot. Today I binged on listening to music, streaming albums from my youth, singing along at the top of my lungs, trying to satisfy my need to make music. It helped a bit. The Con or Bust auction is complete, and a lovely person in New Jersey now has autographed copies of all four books. Someone else will be getting the Del Rey version of The Lost Steersman, as soon as Con or Bust tells me they’ve received the payment. And the Feminist Futures storybundle was a success! I didn’t make a ton of money, but I did make a bunch, and it was nice to be able to hit some bills with solid cash. Also, I bought an Ikea cabinet for my office, because I had some stuff just shoved into a corner and it was driving me nuts. I’m not a neat person as a rule, but I can’t bear to have my office messy. Visual chaos is just too distracting. I’m terribly distractable — one reason I prefer to write in the dead of the night. 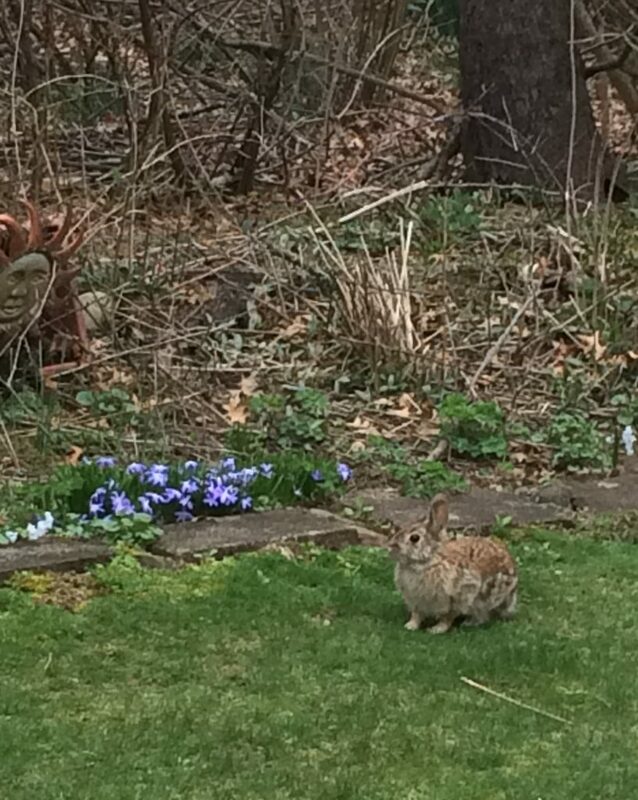 It being springtime, I find that when I come home in the early morning, the front lawn is leaping with bunnies. Daytime photo. Also, back lawn. Some of them seem oddly unafraid of my headlights, and of me trying to sneak up for a good photo. Alas, night photos only result in eerie laser-eye shadow-bunnies, rather ominous-looking. And now — again! — I’ve run out of time, by leaving my blogging until the end of my day. I must get home and get some sleep. I have to shift to a daytime schedule in order to do the home repairs with Sabine for next two weeks. We’ve finally made up a schedule. Yes! Clean that, paint this, remove that and paint it too. Shift the furniture! Spread the plastic, get out the brushes and painting paraphernalia. I plan to watch TV in the evenings, out of sheer exhaustion. 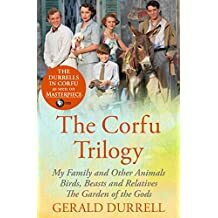 By the way, if you stream Amazon Prime, I can recommend The Durrells in Corfu, based on the memoirs of naturalist Gerald Durrell (brother of the more-famous Serious Literary author, Lawrence Durrell). It’s charming. I enjoyed it so much I went and bought the books, which are even more charming, and have a lot more about young Gerry’s fascination with the native wildlife. I was reminded strongly of my own wanderings in the woods as a kid, every leaf and caterpillar a source of amazement.